LACE UP YOUR BOOTS FOR A JAVA-FUELED ADVENTURE. 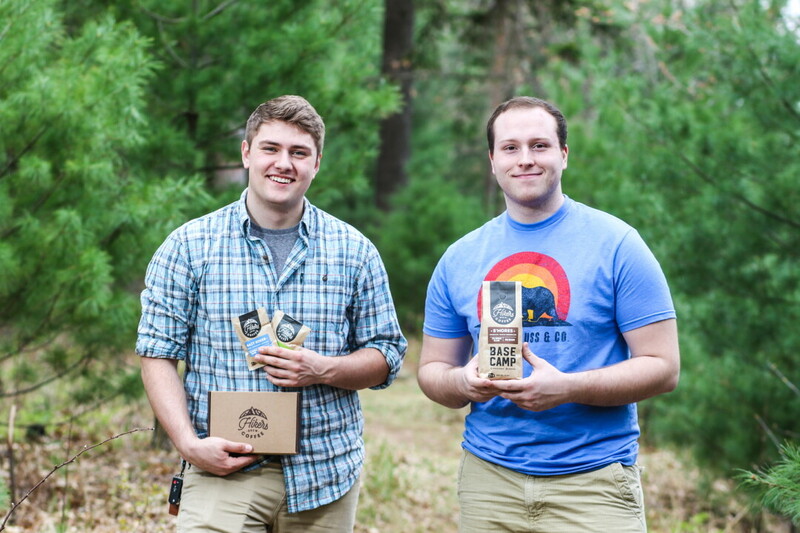 Bob Christopher, left, and Zach Pecha are the creators of Hikers Brew Coffee, a line of gourmet coffees with lightweight, earth-friendly packaging. Campers who are avid coffee drinkers know it can be a struggle to fully appreciate the outdoors when they aren’t properly caffeinated. There is a depressing deficit in the coffee technology field preventing backpackers from enjoying a strong cup of joe in the morning before their next hiking excursion. Luckily, a pair of Eau Claire entrepreneurs has solved this longstanding plight by creating camper-friendly coffee. Campers will no longer have to grimace and settle for instant coffee, a sad excuse for a caffeinated beverage. The company is called Hikers Brew, and it was developed by a pair of young businessmen fighting against terrible coffee substitutes with two travel-ready options. Hikers Brew’s motto is “Adventures Begin With Great Tasting Coffee,” which means mountain hikers, backpack travelers, and general nature-loving adventurers will be impossible to slow down. Creators Zach Pecha and Bob Christopher noticed a problem with drinking coffee in the outdoors: Many hikers and backpackers loved to bring coffee along on their trips, however, there weren’t many products that were lightweight and had a great taste. “It would be an amazing idea to provide fresh coffee shop-style coffee in small and convenient compostable packaging that benefited the environment,” Christopher said. Getting rid of plastic packaging was a must for Hikers Brew as they wanted to provide a green product for people who love to explore our green world. They succeeded: The product is 100 percent compostable, organic, and fair trade. Is this coffee already magical or what? Compostable packaging was important to the creators because, they say, “Biodegradable packaging can be just thrown away, get stuck under garbage in landfills, and take years to break down. Carrots in landfills are found after 20 years that are still orange on the inside. With compostable packaging, it can break down between 50-60 days because you can just throw it in your garden.” The coffee is also packaged in lightweight and compact materials so you can stash, stow, and store fresh coffee grounds anywhere. Furthermore, not only is this coffee eco friendly and convenient, but it is gourmet too, roasted fresh every Tuesday night. Bid farewell to low-quality, flavorless mock coffee forever. The coffee is packaged in two sizes, “Basecamp Bags” and “Venture Pouches.” Basecamp Bags are filled to the brim with 12 ounces of fresh coffee grounds, supplying the traveler with 32 6-ounce cups. However, if you’re not abandoning society for 32 days, a Venture Pouch maybe more your style. Sold individually, they weigh just 1.5 ounces and yield up to four 6-ounce cups. Their plethora of Midwest-roasted varieties, which are sourced from Guatemala and Colombia, include classics such as Dark Roast, French Vanilla, and Medium Roast. For the more daring drinker, Hikers Brew provides Caramel Canyon, Hazy Hiker, and S’mores. 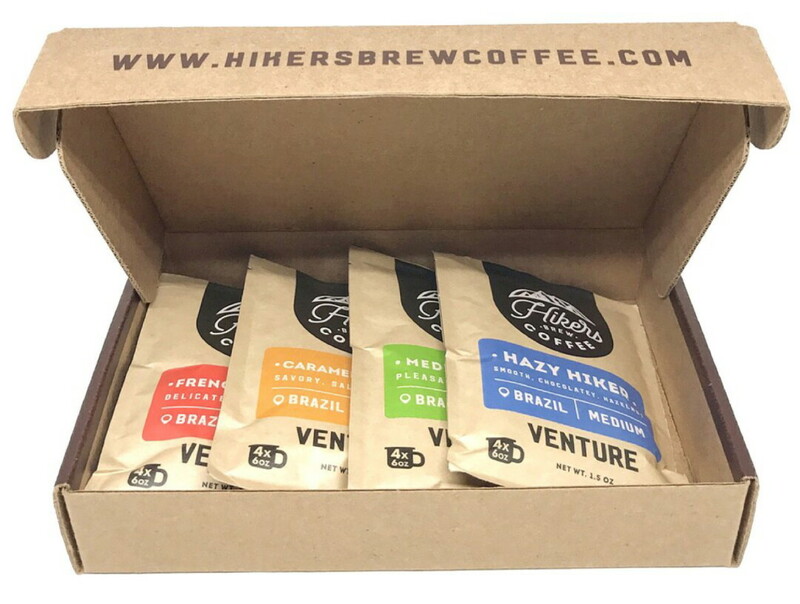 For those trying this product for the first time, Hikers Brew also has a Venture Pack sampler option with one 1.5 oz. bag each of Hazy Hiker, French Vanilla, Caramel Canyon, and Medium Roast in one perfect box. Currently, Hikers Brew can be purchased online or at The Local Store, 205 N. Dewey St. Eventually, its founders hope it will be sold in national stores, too. Learn more at hikersbrewcoffee.com or facebook.com/hikersbrew.